I use my iPad 2 on nearly a daily basis and constantly look for new ways to get more enjoyment out of it. I knew that I could sync music from iTunes on it by using the cable as is done with iPods, but I don't know if I would listen to music enough from my iPad to make it worthwhile. Over the course of the years, I have converted my collection of around 100 CDs into the MP3 format using iTunes. For those who may not be aware, MP3 is one of the most common music file formats, but you need to go into your iTunes settings and designate this choice as the default is Apple's proprietary music format. I'm glad I read one of those "For Dummies" books early on to learn about this as it has paid off. I have been able to copy this music onto a mini-SD so I can listen to it on my cheap Android phone at work and also onto a memory stick so that I can listen in my car. I guess it would follow that at some point I would get to the iPad. First, I took a look using Windows Explorer to find the size. (Tip: to get to Windows Explorer quickly, you can right click the Start or Office button in the lower left hand corner of the desktop in all Windows operating systems prior to Windows 8. Once you locate the iTunes folder you right click and select properties). I found that I had almost 8 gigabytes (gb) of music. To put this in perspective, iPads currently come with 16, 32 or 64 gigabytes of memory. I am fortunate to have a 32 gig iPad, but even so I was not convinced that I wanted to allocate such a large chunk of space to music that I may or may not listen to often from that device. Alas, I thought, lets head to the cloud as that is what has been the buzz for the past couple of years. For those who may not be up to date on this buzz, the Cloud refers to storage and applications that are not stored on your computer, but rather are accessed through the internet by your machine. Considering that my music collection was over 7 gb and being no stranger to Google products (Android, Blogger, Gmail), my first pick was relatively easy. Establishing my Google Drive was so simple that I am not going to detail it here (simply search "Google Drive" and you will find plenty of information). Initially, I attempted to upload all of the music folder that contained my MP3 files directly from the browser. Unfortunately, this attempt was not successful and the full collection did not upload. Due to the size and the time that it takes to upload, I did not have the patience to sit and watch it or spend a lot of time troubleshooting. An easy workaround would probably be to upload parts of it at a time. My next approach was to download and install the Google Drive application for the PC. This fared marginally better - I attempted to let my computer run a couple of hours the day that I initially installed hoping that everything would upload - it didn't. I disabled the sleep / hibernate modes and I also let it run almost a full day on the day following install. It came close, but still did not successfully upload all of the music files. I will also remark that I encountered some confusion along the way. For example, after the install there was a Google Drive icon with my programs (off the start button) and also in the lower right hand corner of the desktop (also referred to as the System Tray or Notification area). What I found annoying is that the Google Drive icon in the Programs / Start area referred only to the location whereas I needed to right click the icon in the System Tray to change settings. I was also confused because I had previously uploaded some music using the browser (my initial unsuccessful attempt), but this music folder (although incomplete) existed in my Google Drive so when the application was installed and sync was attempted, the program wanted to sync that partial folder from Google Drive to my PC instead of syncing the full music folder from my PC to Google Drive. (I figured this one out and as I indicate, this was of my own doing). Even though I was not successful uploading all my music, I had enough out to Google Drive to turn to my iPad. I installed the Google Drive app on the iPad without a hitch and it started to do its thing. After sufficient music was showing through the app on my iPad, I started looking for ways to play it. I know I was naive, but I thought well maybe if I just open iTunes, it will see the virtual drive and treat it just like space on the machine as happens when you install iTunes on your PC and it searches for music on the machine. Needless to say, that was wishful thinking, the iPad iTunes app simply does not work that way. Next, I fished for ideas using Google searches. It sounded like maybe a generic MP3 app might work. I installed 3 of the top rated MP3 apps. None would go out and "see" the full collection. Instead, you needed to click the specific song in Google Drive and then open it in the app whereupon it would be downloaded... well, who wants to do that? I want to turn on the shuffle and let it go while I go on to other things so this technique isn't acceptable for my purpose. In my search I did spot a fleeting reference about a possible future iPad app from Google called DriveTune, but as of now I found no good way to easily listen to music from Google Drive. I will remark that since this usage was not worthwhile for me, I uninstalled Google Drive as the consumption of resources (bandwidth and battery) that is used from the syncing activity simply wasn't worth it for me. So it was back to the drawing board. I quickly ruled out Microsoft SkyDrive because I would not envision any better success than what was experienced with Google Drive when it comes to music on the iPad. Apple's roots are with music and I would envision that because iCloud is an Apple product and iPad is an Apple product, you would probably meet a measure of success. Regardless, I opted not to pursue this path as I felt that the juice wouldn't be worth the squeeze. First, I don't think I would listen to music from the iPad a lot (as opposed to my Android phone at work or the USB memory stick in my car). Second, 5gb just isn't enough space and I'm not willing to pay for space that I would infrequently use. Third, unfortunately, the origins of iTunes accounts were "family" oriented, allowing more than one family member to share. Thus, you already have a small amount of space which is then needs to be further divided among multiple family members... and do I really think that my kids want to access my 60's, 70' and 80's old fart music collection? Probably not. I had nearly given up, but in my investigation, I stumbled upon Google Play. 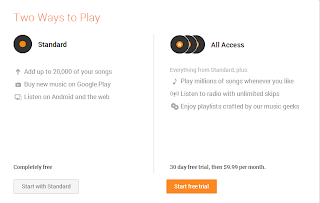 Google Play allows you to upload up to 20,000 of your own songs which you can then play through a browser. So on to Google Play... setting up the account was easy. The big thing that rubbed me the wrong way on the install is that it requires that you provide a credit card to establish your account. Also, note that the default is for you to be set up in the Full Google Play account with a trial period, but costing money thereafter - you need to manually select "Standard" if you want the free account. Who wants to risk forgetting and getting another bill for something you don't need. I suppose this is the way of the future. Other sites such as Amazon and iTunes also encourage you to maintain a credit card on file, but I believe they also permit you to provide it as you need it such as when you want to buy something or set up your account using a gift card. One tip I would have for circumstances such as this is to have one dedicated credit card that you use exclusively for internet purchases. This may help you to contain and control issues that may arise from security breaches. Google Play handled the upload much better than Google Drive. It was able to complete the upload in full, without incident and in much less time than Google Drive had taken to partially upload the collection. I will note that I found the navigation in Google Play very confusing. For example, the location of the settings seemed to move - one time I found it on the top right, another time to the bottom right. Initially I tried to listen to my collection using Google Chrome on the iPad (thinking that Chrome and Play both being from Google would be the most compatible). I found that some settings did not appear / become exposed as they should have. I went to the iPad's default, Safari browser and fared better. The Google Play settings functioned and I was able to get a mediocre result. I enjoyed that I could select the shuffle, but found that the shuffle would last for about 2 to 4 songs and then stop and I would have to return to Safari to restart it. Due to the infrequency that I expect to play music from the iPad, I will probably just settle for Google Play for now. Unfortunately, the music from the clouds on my a iPad will likely be largely generated from those voices in my head.